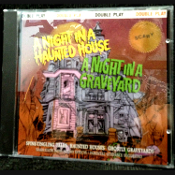 ONE OF THE BEST EVER HALLOWEEN HAUNTED HOUSE CD's! Rare retired collectible… very hard to find new, but definitely worth the hunt… More than just sound effects! This timeless audio cd will guide you on a strange and fearsome journey through a haunted house, and then a graveyard, in a world of spirits full of twists and turns, where nothing is what you’d expect. The narrator has a chilling deep voice, and is your storytelling tour guide throughout your creepy visitation of the haunted house and graveyard. The awesome realistic surprise sound effects on this cd are unequalled for scary background scene setting. You never know what's going to happen next... This collection of stories is a must have for any Halloween buff. You will not be disappointed!!! The Narrator’s speaking voice is deep and creepy, as he leads you through various rooms in the haunted house. He takes you into each room: a mad organist, chamber of horrors, bats in the belfry, laboratory, haunted ballroom, snakepit, dungeon, hounds of hell, room of eternal silence… better get the heck out with a long fuse and dynamite! Each scene is different, with unique sound effects. And there are other unknown dangers, where you and the narrator experience all kinds of freaky things, and it seems like you really ARE being guided through a haunted house and graveyard, so be warned: DO expect the unexpected! We have personally owned a copy of this CD, since we discovered it about 20 years ago, and have never again found any special effects sounds or music to match the horror and spooky feelings rendered. It is by far our very favorite Haunt cd!!! We formerly piped it outside of our own ‘’haunted house’’ for many years on Halloween, to give visiting trick-or-treaters the perfect eerie ambiance for ‘’all hallows eve’’. Today, we still play it for our own huge adult costume party, in our completely decorated, dimly lit ‘’Haunted Forest’’ in the garage. It still thrills and chills all who hear it! *Not recommended for anyone of a timid disposition or children under 9 years old. Double Play Single CD. Compact Disc Digital Audio. Stamped with the ‘’Scary - Transylvania Seal Of Approval’’. *Do not listen to this recording alone. May be hazardous to your health. Parental Guidance Suggested. A Night In A Haunted House: Side 1: 22 min. 11 sec. Ghostly winds, old doorbell, door opening and closing, heartbeat, maniacal laughs, groans, screams. Door opens revealing mad organist at work, door closes. Bats squeaking and flying overhead, nesting owls. Electrical airs, test tubes bubbling, insane professor chuckling and laughing, Frankenstein’s heartbeat and groans upon coming to life. Ghostly music by Victor Herbert. Man walking in suit of armor, ghosts, moans, dungeon keys rattling, dungeon door opening, rats squealing and scurrying, dungeon guard laughing, whiplashes and agonized groans, man pulling ball and chains, big door slams. Pin dropping, plate glass window smashing. Match striking, fuse lighting and sputtering, big bang. A Night In A Graveyard: Side 2: 25 min. 24 sec. Ghostly wind, owl hooting, funeral bell, wolf howling, lightning strike, thunder, ghost noises, heartbeat, man screams, match strike, lamp lighting, ghostly wails, heavy breathing, quickening heartbeat, screams. Wind, bell, heartbeat, wolf, gate unlocking, wild cat, screams, maniacal chuckles. Distant thunder, wolf howls, eerie wind, torrential rain, searing lightning strikes, rolling thunder claps, ghostly laughs. Owl hooting, ghostly noises, bats, heavy door unlocking and opening, door slamming, match striking, rats scuttling and squeaking, cat snarls, bats fluttering and squeaking, ghosts, eerie laughs, vampire coffin opening, vampire roars, plate glass shattering. Wind, atmosphere, bell, bubbling cauldron, fire cracking, several witches cackling and preparing potions, witches casting spells and sending tortured souls to wander in limbo. Funeral bell, wind, heartbeat, werewolf, the undead chanting and searching for victims. CD is brand new, factory sealed. Released in 1991 by Symphonette Music Dist. Halloween A NIGHT IN A HAUNTED HOUSE - A NIGHT IN A GRAVEYARD cd - Scary creepy narrated Halloween costume party sound effects.